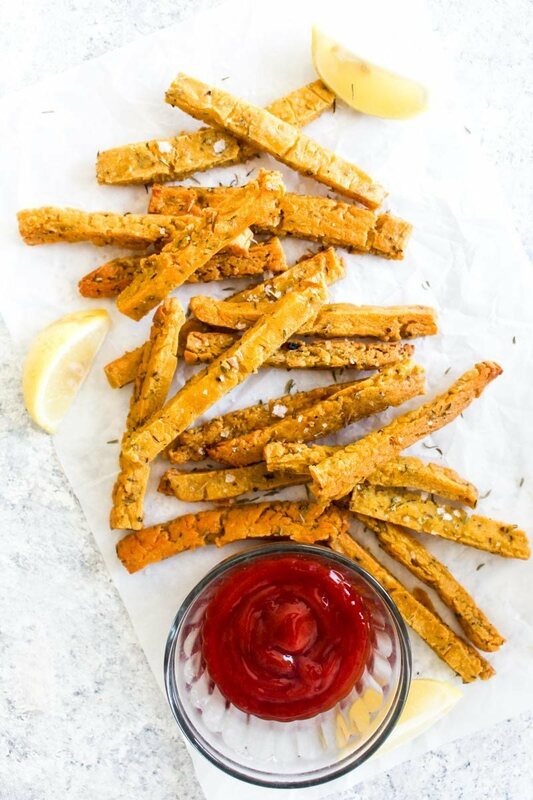 Perfectly golden brown and crisp with a creamy interior, these 3 ingredient baked Chickpea Fries are the perfect dinner side. Gluten free and vegan too! Line a 9x9 baking dish with a parchment paper sling. Set aside for later. In a saucepan off the heat, whisk together the chickpea flour, salt, thyme, and garlic powder. Add in half the water and whisk until there are no clumps of flour left in the batter. Add the remaining water and whisk until smooth. Place the mixture over medium heat and cook, whisking constantly, until it becomes thick like oatmeal and the whisk exposes the bottom of the pot when stirring. Pour the mixture into the prepared pan and use a spatula to smooth out the mixture into one even layer. Place another piece of parchment over the top of the mixture and gently press it down. This keeps the fries from forming a skin. Transfer the dish to the refrigerator and let it chill for 2 hours. After the mixture has chilled and set, remove it from the pan using the parchment sling. Remove the top layer of parchment and slice it into fry shapes. Grab a baking sheet and drizzle it with a generous amount of avocado oil to coat the pan. Line your fries up on the pan and bake for 12 minutes. Flip the fries and bake for another 12 minutes. Remove from the oven and serve.